Last Friday was a great day at WDG, and not just because it was Friday, but because we successfully launched ARSA.org. 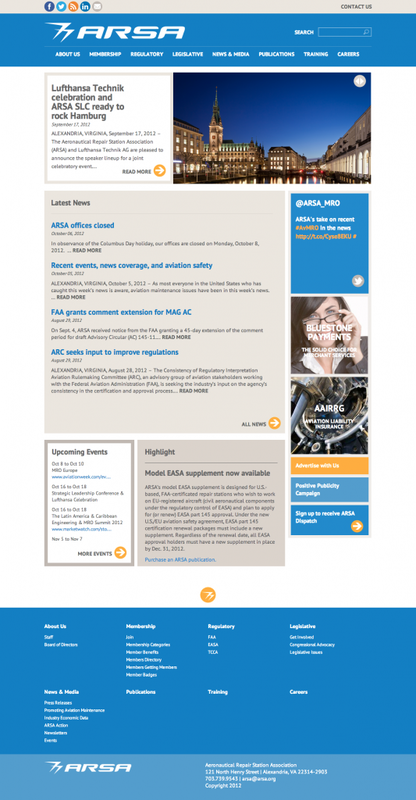 When the Aeronautical Repair Station Association approached us looking for a new website, they were on Drupal. We custom designed and developed a website on WordPress that met all of their specific needs. The WordPress design engages its audience and pops with bright colors. With regards to the development, there is an events calendar that pulls in feeds from Outlook, incorporates Twitter, and the site is user-friendly with intuitive navigation. ARSA.org is a particularly content heavy website. Our design team worked their magic, like they always do, and were able to build an engaging website with minimal graphics and a focus on text. This was done primarily by creating a slideshow that has a strong, central image. The ads are rotating and ARSA cross advertises with others in their field. Finally, we wanted to make sure that the site was social and engaging. Social media buttons are prominently placed at the top of the page and the whole site is responsive. Allowing for a responsive website means that the ARSA audience will be able to see the website in all of its glory from any mobile or tablet device. At The Web Development Group, we make sure that all of our websites are built with the targeted audiences in mind. We are a top DC WordPress and Drupal web development company that creates sleek, modern, and professional web presences. Located in Old Town Alexandria, we have worked with companies and organizations of all sizes to ensure that they have a web presence they can be proud of. If you are interested in getting a new web presence, you should get in touch with The Web Development Group. We have all the experience necessary to make sure that your brand is represented in a professional, modern way. Our DC web development company will work with you every step of the way.